A new species of cricket! 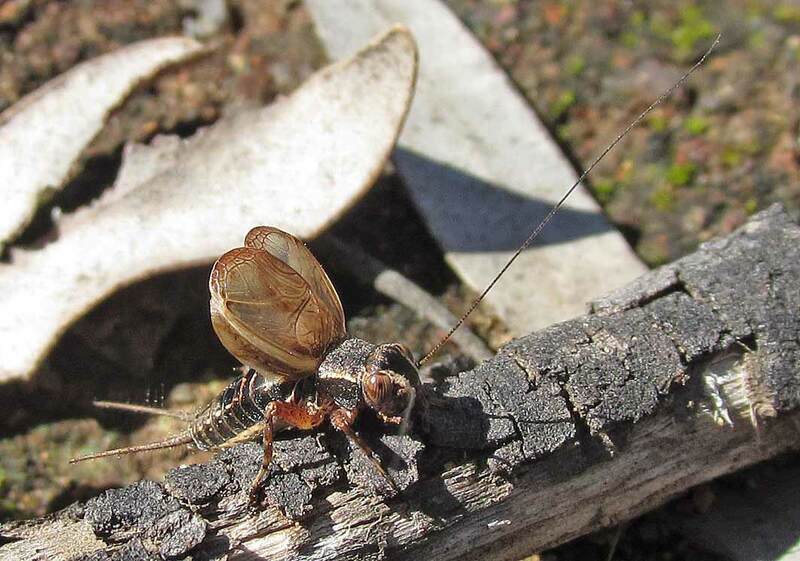 There are many thousands of cricket species across Australia so finding one new to science is not all that difficult. 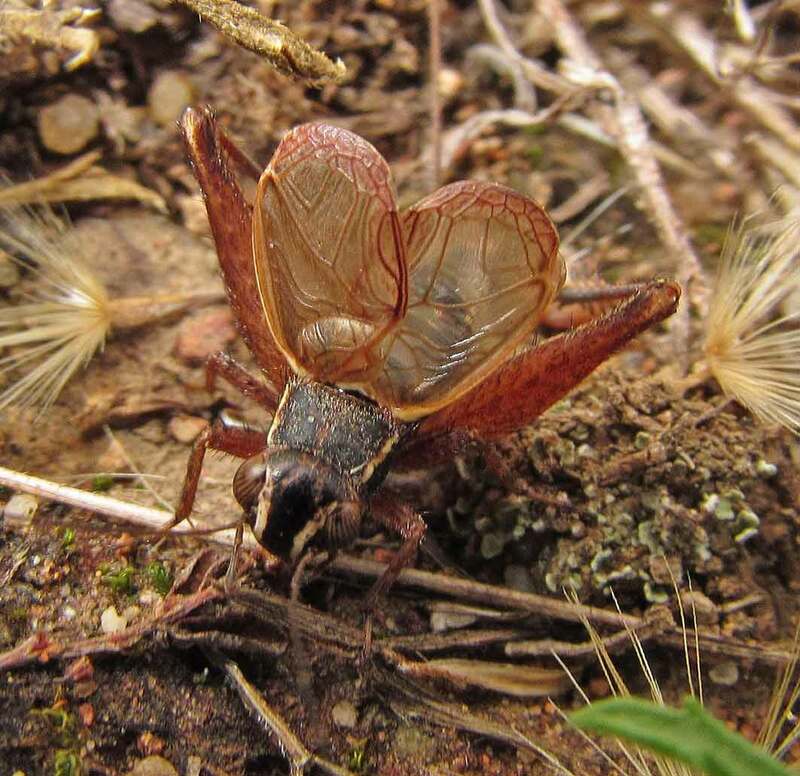 My new species was trilling on my back lawn in daylight hours during March-April, 2012 (autumn in Australia), with air temperature mild-to-warm at 20-25 degrees C. After photographing and recording this cricket but being unable to identify it, I caught four specimens and sent them to entomologist David Rentz for analysis. David was mystified and consulted with his colleague Dan Otte, who thinks it may a new species of the genus Salmanites. This genus has only been found in Queensland and the Northern Territory, and not yet in New South Wales where I live. So, here is my new species described with photos, sound recordings and movies. 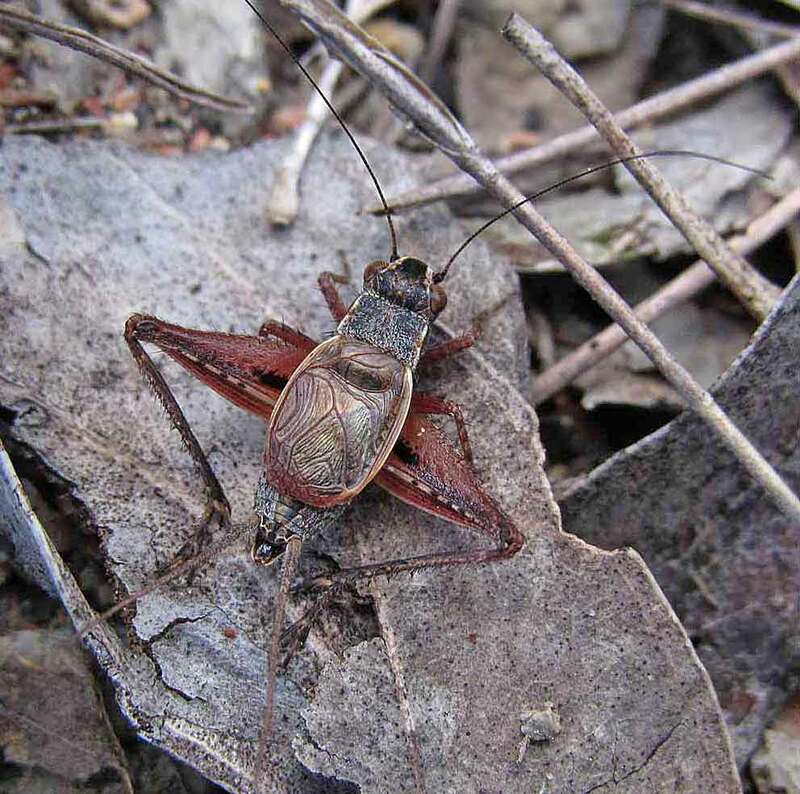 The cricket (christened Red-brown for the moment) is ground-dwelling, about 1 cm in length, red-brown in colour, prefers sparsely vegetated patches of ground within grassy box-gum woodland habitat. Judging by the calls, the species was very numerous during March and early April within a 2 km radius of my home in Capertee Valley, NSW. photographs and movies taken by Vicki Powys with Canon Ixus 1100 HS camera. Movie was recorded 27 March 2012 between 5.30 and 5.40 pm DST, temperature about 20-23 C, overcast. The sound of this cricket reminded me of the shaking of maraccas, with a regular rhythm that varied in speed according to localized temperature. Daytime air temperature during the times I was recording ranged from 19 degrees C to 23 degrees C. The crickets called faster if the sun was shining on them. The number of chirps per second ranged from 2.2 chirps per second to 7.4 chirps per second. Here is a composite recording of 5 different chirp rates, going from slow to fast. The pitch was higher when the chirp rate was faster, ranging from 4 khz to 5.5 khz. 1 chirp has 3 pulses (waveform is one-tenth of a second in length). To hear the detail I have slowed the sound to one 126th of the original recording speed. You will hear how the sound vibrates rather than ticks, with each strike. The wings of the cricket are harmonically vibrating to produce the sound. 1 pulse has 80 – 100 cycles. Each cycle represents a strike of the scraper against a single tooth. 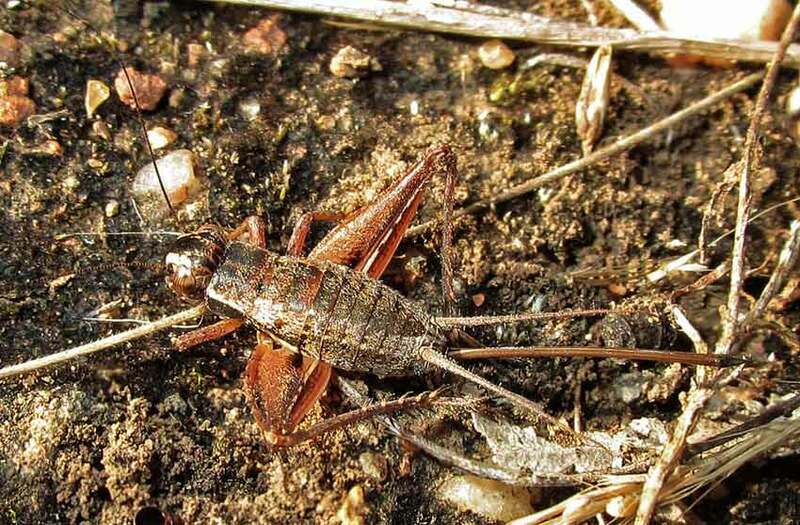 Crickets produce sound by rubbing the right wing over the left wing (the opposite to katydids which rub left wing over right wing). 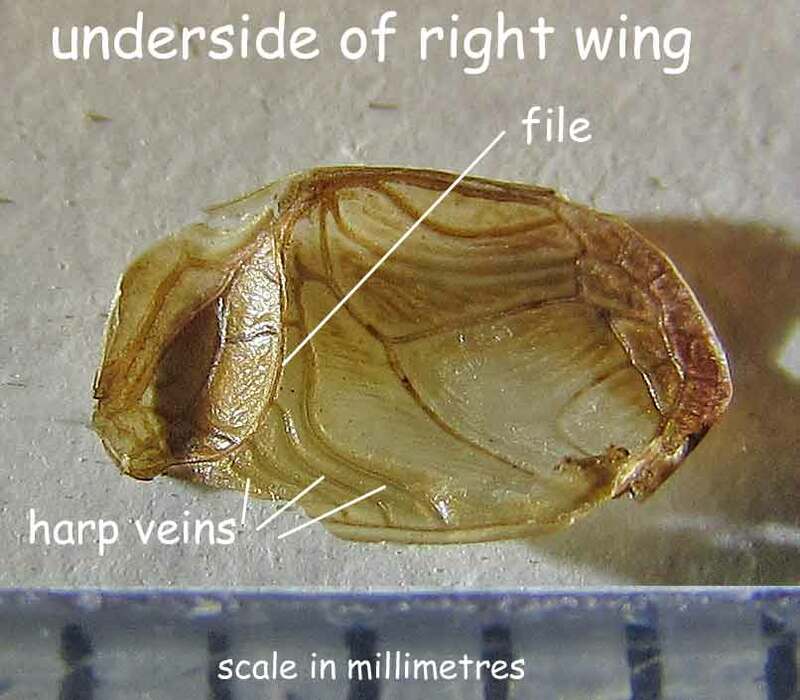 There is a file on the underside of the right wing that comes into contact with a scraper on the top inside edge of the left wing (like a fingernail running along the teeth of a comb). 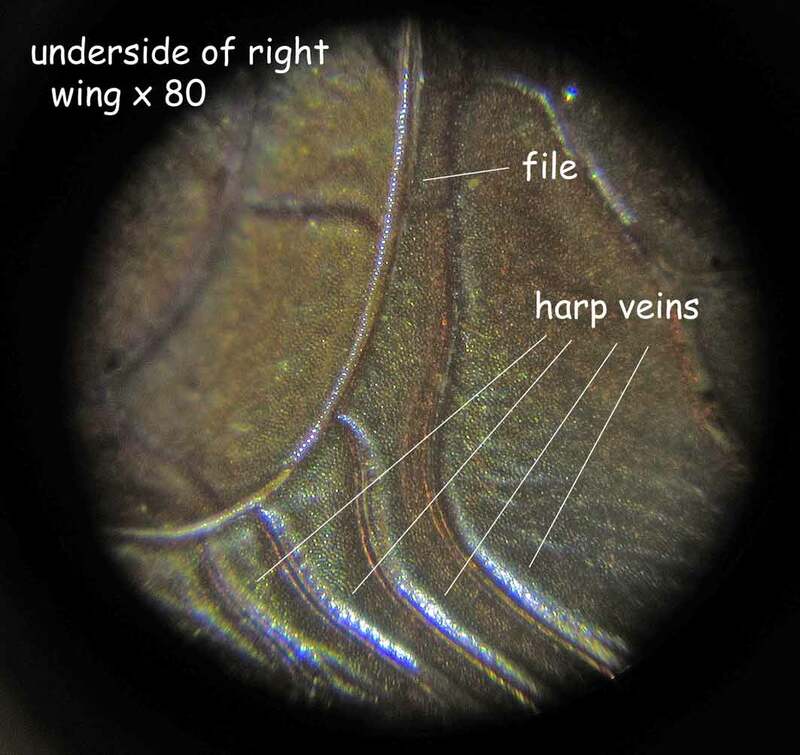 Every time the wings move inwards the scraper whizzes along the file to produce a pulse. When the wings move outwards the scraper and file do not touch. So the red-brown cricket will be moving its wings in and out about 15 times per second to produce its song, and there will be about 1350 tooth-strikes (cycles) per second as the file and scraper whizz back and forth. (i.e. five chirps per second, 3 pulses per chirp, 90 cycles per pulse). If one pulse has 80-100 cycles, that SHOULD mean that the file has 80-100 teeth on the underside of its right wing. I examined a right wing using an ordinary microscope and shone a powerful torch directly onto my specimen. Yes! I could see a long row of teeth, tiny pinpoints of light looking like a string of pearls under x 80 magnification. I used my Ixus camera to take a photograph while looking down the barrel of the microscope. When I counted the teeth there were 99 of them. Count the teeth! I got 99. Crickets hear with an eardrum that is positioned just below the knee joint on each fore-leg. Here is a x 40 microscope image of the right fore-leg of the red-brown cricket. 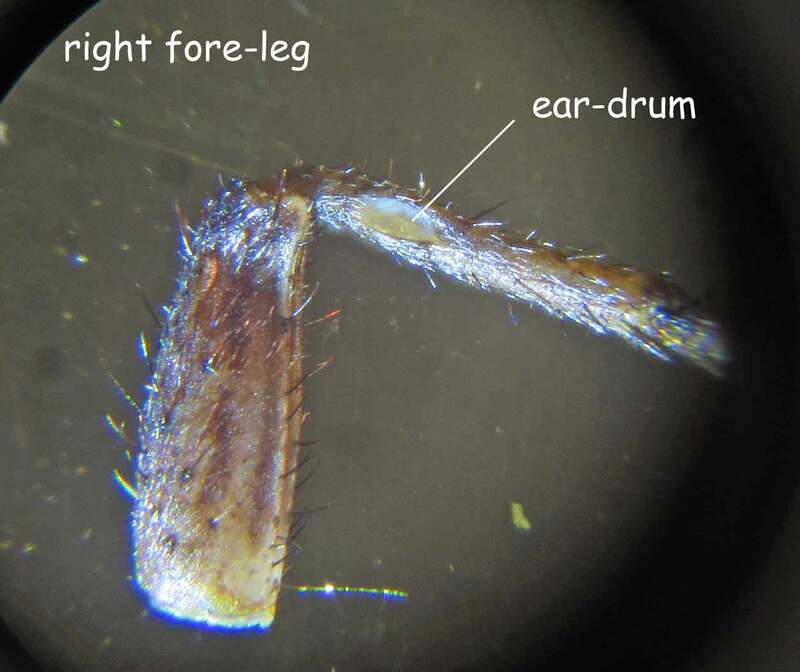 For this species, the eardrum is positioned on the outer side of the leg. I wanted to better understand how cricket wing movement related to the sound. There is always just a blur of wings even in a slowed-down movie. 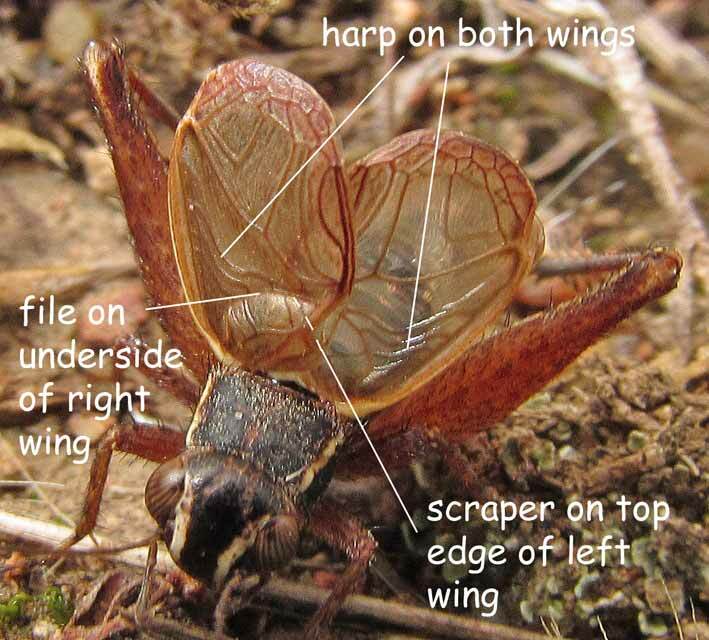 So I photographed the underside of the wings from a specimen of the Redbrown cricket. 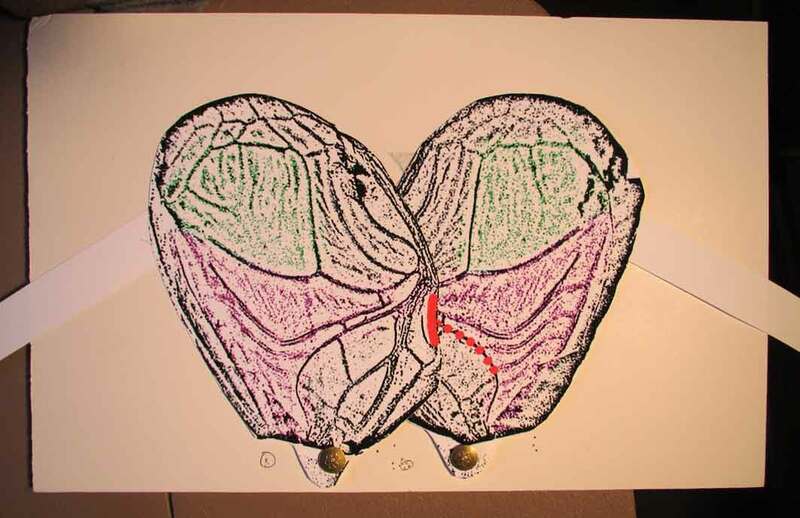 Then I posterized this image in Photoshop, coloured-in the relevant sound-producing areas such as the FILE & SCRAPER, printed out the image on a sheet of A4 card, and cut out the greatly enlarged wings with a pair of scissors. 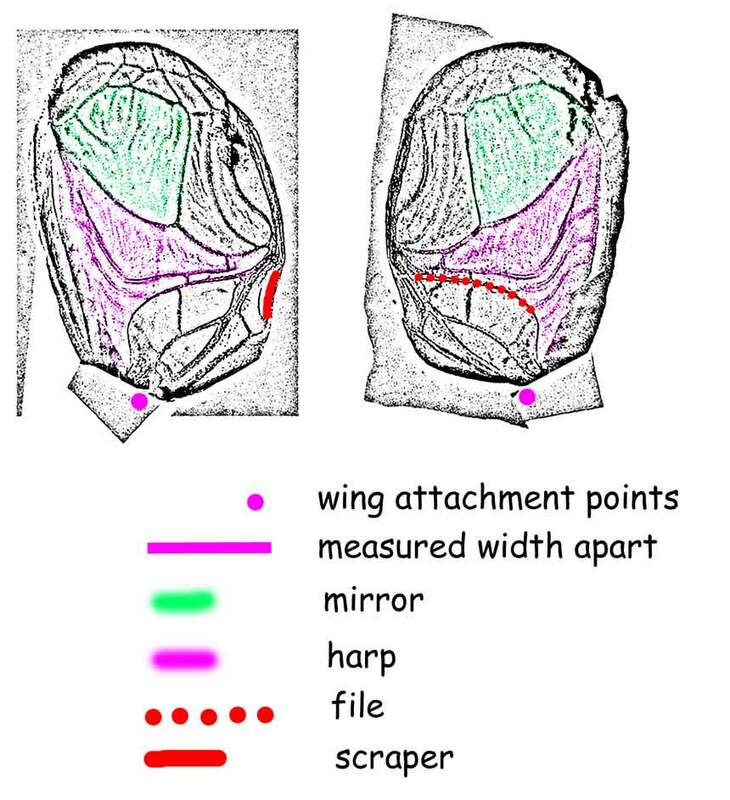 Showing underside of wings – the left-wing scraper against the right-wing file produces a vibration which is amplified by the harp and mirror areas of both wings. I pinned my cut-out wings at their pivot points to a piece of cardboard and added paper strips for ‘handles’. Then I made a sound file with the sound slowed to one-thirty-second of the original speed, and played the sound through a small speaker while I moved the wings in and out in time with the pulses. Each time there was a sound, the wings were moved inwards. 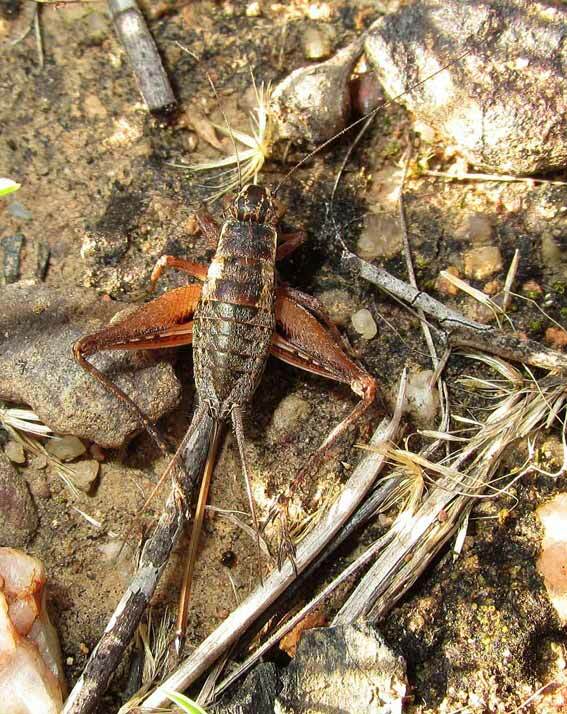 All crickets make their sound with the inward wing stroke while the outward stroke is silent. With my camera on a tripod I made a short movie representing one second of original sound and action, expanded out into 32 seconds of movie. You will see 5 chirps with each chirp being made up of 3 pulses (the Red-brown Cricket gives about 5 chirps per second). This 40-second Quicktime movie will open on a new page and may take a few moments to download as it is 5 mb in size.